The John Steuart Curry murals are a finalist for the 8 Wonders of Kansas because Curry was one of the greatest American regionalist painters and, despite great controversy, he considered the murals in the State Capitol his greatest work! 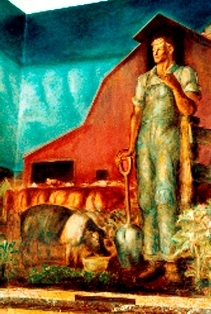 In June 1937 John Steuart Curry, a famous Kansas artist from Jefferson County, was commissioned to paint murals in the Kansas Statehouse. Before Curry finished the second-floor murals in 1942, he received criticism from legislators and refused to sign and complete all the murals that he had planned. The most famous of his finished murals is the one called, "Tragic Prelude," Curry's interpretation of John Brown and the anti-slavery movement in Kansas Territory. 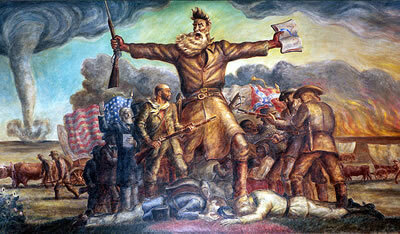 Rich in symbolism, the painting depicts a fierce John Brown holding a Bible in one hand and a rifle in the other. Curry's critics disliked his color scheme and the over-all menacing effect of the mural. Curry painted the "Kansas Pastoral" mural in an attempt to show the more romantic side of his native state. Critics found disapproval of the Hereford bull saying it was too red, too long, and the neck was too thick. These scenes are only a portion of the murals Curry had planned for the Capitol. Eight panels in the rotunda were proposed to depict the life of the homesteader. Because of the criticism of Curry's work and opposition to removing marble panels to create additional space for the artworks the eight scenes were never painted by Curry. Still, the murals are known as some of the greatest public art in the country and, as Curry said "they are historical monuments." Lumen Martin Winter was hired to use Curry's sketches and finish the murals, which he did in 1978.